True or false. You can lose weight by eating nothing but celery, because a stalk of celery only contains six calories but it takes your body 10 calories to digest it. I reckon its sounds true. It’s the cream cheese or peanut butter or Vegemite that adds the calories. Well cream cheese or peanut butter would certainly add a lot of calories, but you’re not going to lost weight just by eating celery and letting thermodynamics take it’s course. First of all, a stalk of celery only takes about half a calorie to digest, so you’re not going to burn calories by piling on the celery. You probably will lose weight if all you eat is celery, because it’s not going to provide enough caloric value to cover your body’s metabolic functions, unless you eat absurd quantities of it. 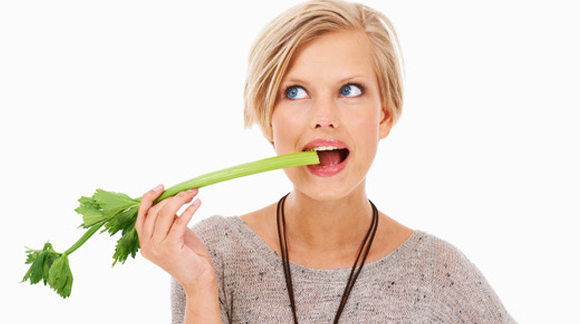 Of course, you will probably wind up missing out on a number of necessary minerals and nutrients on an all celery diet.